I’ve been interested for a long time in green sickness, a condition affecting girls at puberty that involved menstrual suppression, often along with some sort of dietary ‘blockage’. The remedies for it, over the 400 or so years that it was recognised as a disease, raise all sorts of problems. For example, in the 19th century it was seen as a form of anaemia, so iron was prescribed. In the 17th century, before that level of knowledge of blood existed, ‘steel filings’ were often part of the remedy, and iron is a constituent of steel. So, how did they know to use steel? Or was this nothing to do with the iron content, but instead about steel being imagined as ‘cutting through’ the blockages? Langham’s text. From http://www.cardiff.ac.uk/insrv/libraries/scolar/digital/healthyreading.html . Copyright: Cardiff University, used with permission. William Langham wrote ‘The Garden of Health’ in 1597. It was based on earlier recipe collections, and I came upon it when I was thinking about using recipes to tease out what exactly was supposed to be causing the symptoms – so, if the recipe involved plants that were clearly evacuative, then this could suggest that the cause of the disease was seen as a blockage. Langham arranged plants in simple alphabetical order, rather than arranging the material under the names of diseases; but, as part of his accessibility, he also gave a list of conditions with references to the different plant entries where the reader could find out more. Elaine Hobby pointed out to me that this recipe also appears in 1677 in ‘The Accomplish’d Lady’s Delight’ by ‘T.P.’ (possibly Hannah Woolley), but with ‘red Fennel’ instead of ‘red Mynts’. 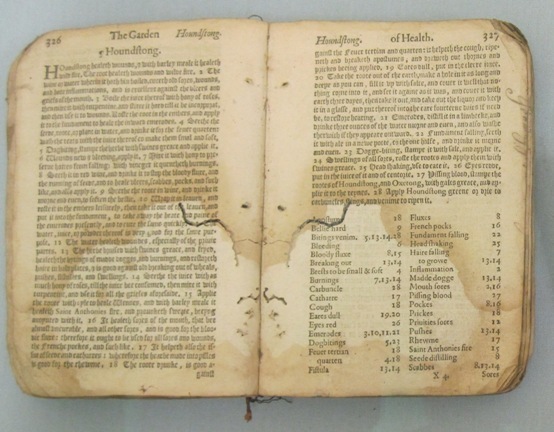 There was a second edition of Langham in 1633, and maybe the author used this. So what’s all this red about? Betony, sage and marjoram often appear together in later collections as a gentle sternutatory. Red sage and betony are used against bilious attacks. Ash keys feature today on ‘wild food’ sites with the warning that they are very bitter and need to be boiled several times before eating, but what was used here was the ripe seed, dried and then reduced to powder. The ash-powder is used elsewhere for the stone (by provoking urination), jaundice and dropsy. So maybe there’s something here about getting rid of obstructions. But to me, all this redness suggests the colour of blood, and the use of running water also makes me think that this is aimed at restoring or establishing a normal menstrual flow. How do we balance the known effects of the plants chosen, with the symbolic power of red? Comments please! Helen King is Professor of Classical Studies at the Open University, UK. Her book on green sickness is The Disease of Virgins. Previous PostPrevious To Preserve Quinces, White or Red?